Did you know you can "follow" my blog? It is easy to do and is great for keeping up with any new postings on your favorite Blogger members. First click on the "Follow" link on the right side of the screen. Sign into your Google, Twitter, Yahoo! or a number of other accounts. You will then be asked how you'd like to follow the blog (either public or private), and then finish up by clicking the "Follow this blog" button. It is that simple, you are now a follower of my blog! If you elected to follow the blog publicly, your profile picture will be displayed on the blog with a link to your Blogger profile. When you become a follower, the blog will also be added to your Reading List on your Blogger dashboard. Additionally, you can become a follower of any blog or URL (even if the blog doesn't have the Followers widget) by adding the blog to your Reading List on the dashboard. I use my reading list on my Blogger dashboard daily to see who has posted something new. While everyone I follow doesn't publish something everyday there is usually at least one new post to read. I have been taking photos of my baskets since I first started weaving. 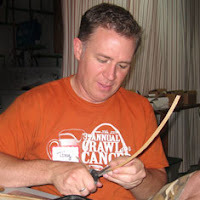 Fortunately not only my weaving, but my photography skills have improved over the years. Photographing your work is a great idea for a number of reasons. First of all it documents your work and your progress. 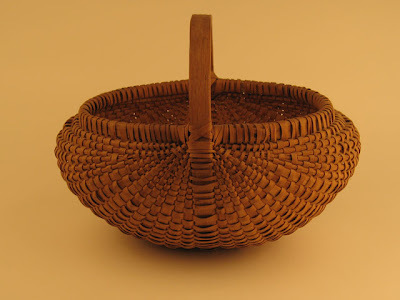 There is nothing more humbling and gratifying than to look at photos of your early baskets. Often times you don't even realize how much your work has improved over the years. Also photographing your work is important for building up a portfolio if you would ever like to approach a shop to teach or sell your work. 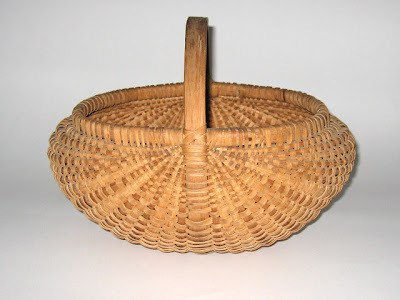 It is much easier to carry around a photo album than a bunch of baskets to a meeting. Good quality photos are also important when you want to start marketing your work to potential buyers or students. Here is one of my early photos. It displays a number of common product photo errors. Unlike a nice snapshot of a Sunday family picnic, you want only your basket to be the focus of attention. In this example it is hard to tell which basket you are supposed to look at let alone if you supposed to be looking at a photo of an antique quilt. 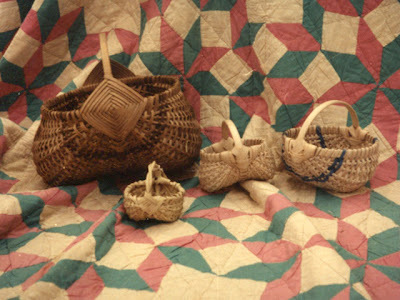 So lesson one, a plain background is best and one or two baskets is probably best unless it is a set and then you have to be mindful of how you arrange the baskets. I kept seeing professional basket photos that looked great, but it took awhile before I finally figured out why they were better than what I was getting back from the One Hour Photo (remember the days of film cameras). I finally realized that a plain background was going to get me one step closer to my goals. At first I had a big piece of neutral colored fabric that I would use as a backdrop, but that was a tad bit cumbersome to get setup. I was also limited to shooting indoors and my camera flash gave me terribly harsh shadows. I eventually switched to a white paper background that was convenient to take outside and clip to the chain link fence. A nice slightly overcast day gave me the perfect shadows, but usually also meant rain was on its way so my photo shoots would often be abruptly cut short. A nice bright sunny day would work if there were big puffy clouds floating by. Unfortunately waiting for that perfect cloud to pass over the sun was a test of patience. Also my window of sun angle was only a couple hours a day, so trying to find the perfect weather on a free day around 1pm was not very easy. Finally I set up a little photo studio in the basement that was relatively portable so it could be taken down and put up as needed. Wow, not being tied to the weather or time of day was soooooo nice. It was also much easier to shuttle baskets up and down the stairs instead of out into the yard. A true professional setup would cost a small fortune so I opted for the homemade version. Since I was going to be photographing indoors, no less in the basement, I knew I would have to use artificial lights. From my earlier experiments I knew that a flash wouldn't give me the results I was after. Fortunately from working with professional photographers at my day job I knew that strobes with large "soft boxes" would give me the nice soft light and shadows I desired. 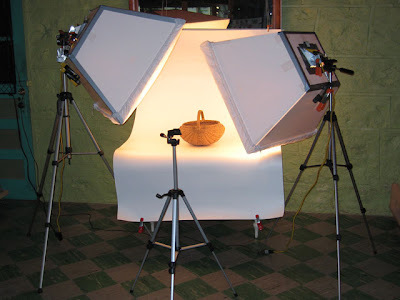 Unfortunately after a search on the internet I knew there was no way I could afford the lights let alone the soft boxes. So I dug around some more and found plans for homemade soft boxes, a few sheets of used foamcore board, some duct tape, white banner fabric, halogen work lights and a couple of old camera tripods picked up either out of the trash or at yard sales and I was ready to go. Below is my set up (minus the camera which I was using to take the photo). To demonstrate why the soft boxes are so important here is what the photo would look like using the built-in camera flash. 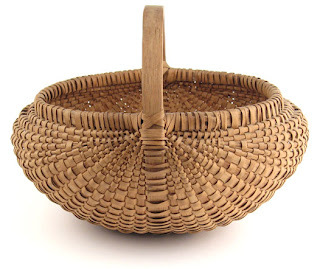 While not horrible, the lighting is too harsh and the shadows are hard and don't help give you a sense of the shape of the basket. The human eye is an incredible organ, it is able to automatically adjust for different levels of light, but did you know it is also able to auto white balance? Actually it is your brain that is doing the white balancing, so that when you look at something you know is supposed to be white your brain automatically adjusts for the color or quality of the light source. Your camera isn't so smart, so that is why under florescent lights people often look greenish or too yellow under regular incandescent bulbs. Case in point this is what my basket looks like under the halogen lights. If you saw this background in person you would swear it was white, but that is just your fancy eye and brain doing some tricky white balancing. Though some trial and error I was able to figure out how to manually set the camera to adjust for the color (or temperature in professional terms) of the light. The "tungsten" setting did a pretty good job of balancing the color and a minor adjustment in exposure and this is the resulting photo (my camera remembers my the last manual settings made so I never have to change anything). This photo is about 75% complete. Since I am such a perfectionist I like to take the photo into Photoshop (thank God for digital photos) and do some minor tweaking. After making the background a bit brighter, cropping a bit tighter and cleaning up the edges of the shadow this is the resulting photo ready for posting on my website or printing in a brochure or flyer. I know this was a very quick overview and didn't provide a lot of specifics. Also I have a particular style of photo I like, e.g. a basket on a completely white background, but I hope it is an inspiration to make your basket photos the best they can be. The best thing is that most digital cameras today can give you great, near professional quality at a fraction of the cost of a big SLR unit. The camera I currently have is a 7.1 mega pixel Cannon PowerShot SC550, which is basically a point and shoot pocket camera. Below is my response to Bonnie Krist of Weaver's Words when she asked for suggestions on what a "dream weaving studio" would include. She had a new free standing building so some of these things aren't necessary for a home studio (e.g. hopefully you already have running water in your home!). 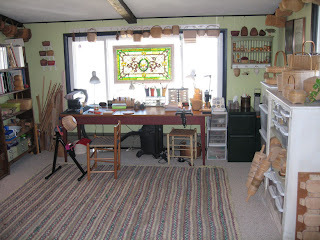 I have also modified my response a bit as I now have a big table in the middle of my weaving room. Overhead florescent work lights with daylight bulbs (I normally am not a fan of florescent light, but got one for my laundry room area of the basement and splurged for daylight bulbs and wow do they produce a lot of nice white light, the fixture cost very little at Home Depot. I am thinking about adding some more to my basement. Folding chairs - a lot of these if you think you will hold classes or have people over to weave (I have one weaving chair and one stool that stay in my studio all the time, but about 14 folding chairs that move about depending on the folding tables that are set up. Shaker pegboard and shelf running the whole perimeter of the room along with pegs on all the rafters. Basically I could do almost anything with just these basic power tools along with basic hand tools. 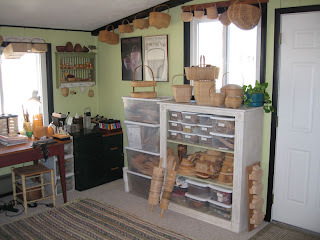 Here are some photos from my basket room, it is about 16" x 14" I think with lots of natural light (though I seem to weave mainly at night). 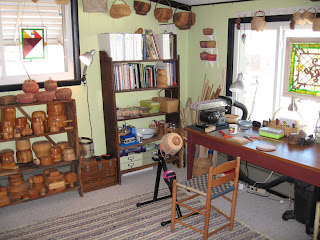 I have the two chairs at my work table, one at the weaving/sanding station and the other (actually a stool) at the drilling station. I now have a large, 5"x6" table in the center of my room that I LOVE. It has storage in the base and can seat eight people comfortably. 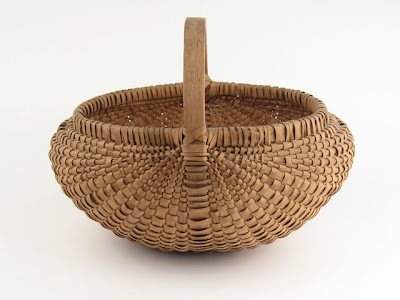 Basically you will want to set up your room to accommodate the kinds of baskets you weave. 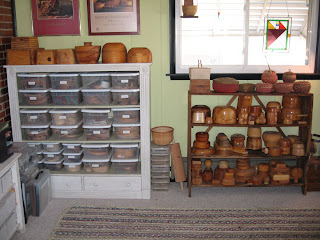 Since I usually only weave baskets that are no larger than 10" I don't need a lot of table space so dedicate more of that to my tools, but I do have lots of molds so have a lot (but never enough it seems) of shelves for those. I also store everything in small plastic tubs (since again my materials are smaller) and dedicate lots of shelves to those. Good luck with your new space, you are going to love it.